Despite some inclement weather, the Arkansas River had a productive last week of April with baetis mayflies, brachycentrus caddis flies, and crane flies all emerging and bringing fish to the surface. And while the first few days of this week look to be similarly cool, the twelve days starting with Tuesday, May 3, are forecast to produce highs in the 60's and 70's.This shift back to warming weather should reignite the caddis hatch, which stalled on cooler temperatures about a week ago. If the forecast holds, we anticipate active caddis over a large area of Bighorn Sheep Canyon and beyond, perhaps reaching from Texas Creek clear upstream to the Big Bend. In addition to afternoon caddis activity in Bighorn Sheep Canyon, expect morning emergences of crane flies and afternoon hatches of blue wing olive mayflies. It should be noted, the mayflies are actually active nearly river wide from Texas Creek upstream to Granite. Key to distinguishing which bugs are actually feeding the fish at a given time is the riseform of the fish and an honest assessment about what is really available to them. When feeding on blue wing olives, trout will feed rather delicately on the adults, just poking their nose above the surface, and will present a porpoising back and tail when feeding on emergers. Drifting nymphs will generate good "flash" up in the riffles. The crane flies draw a very splashy rise in the mornings, as do the caddis in the afternoons and evenings. 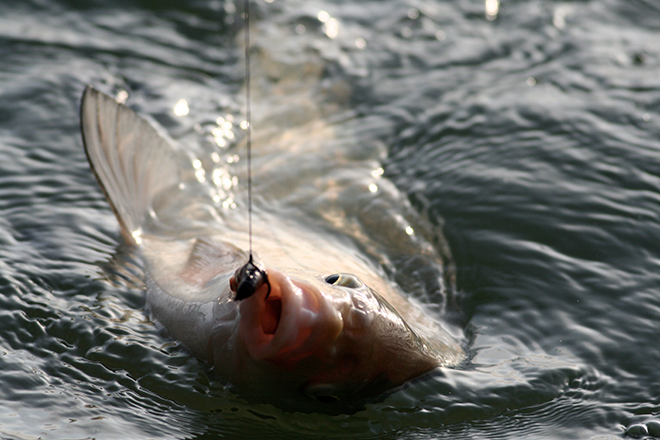 Watching the surface of the water and or seining/checking stomachs is key as well to determining the focus of fish. The fact that the air is alive with caddis adults does not necessarily mean that those bugs are actually available to the fish. One needs to keep this always in mind - it's easy to succumb to appearances and then go about one's day fishing under false pretenses! The reservoir is currently at 224,000 acre ft and the temperature has dropped a few degrees due to the weather. We are still receiving reports of anglers catching wiper and white bass and we are starting to hear of crappie being caught. The water temperature is warmer south of the trestle and that is where most of the success is being reported. We still have not seen many walleye or saugeye being caught on the main reservoir. Fishing at the stilling basin and Lake Hasty is slow we are only seeing a few catfish and trout being caught. Water temperature around 52 degrees. Things are heating up on the big desert reservoir. Namely, walleye are all the talk at this time of year. Fishermen are having success using a variety of methods. Fisherman caught some in the 16 to 18 inch range at a depth of 12 to 16 feet using soft body jigs. Smallies are responding to jigs, and crankbaits as well as jerkbaits from the rock rubble shorelines. Some bass are using plastics as well. Flows on the tailwater below the dam have increased, as winter water storage has ended. Water is being released to make room for runoff, which is just around the corner. Fishing has been good on the tailwater for trout. Even with the increase in release, flows are still relatively low, and the river is still manageable for wading. Anglers are reporting success on blue wing olive and midge patterns. Both boat ramps are open at this time. Boat ramps are now open and the lake is open to fishing. Early season is a great time to chase big pike. Several pike are being caught on Martin, as well as Trout on both Horseshoe and Martin. Stop by the Visitor Center to show off any catch. The lake is at 871 surface acres with a surface elevation of 6196.40. The surface temperature is in the mid 40's. Shoreline anglers are still catching trout using various Powerbait and homemade dough baits. We had a report of a catfish being caught in Reilly Canyon using nightcrawlers. Boating traffic was slow due to weather. We still got a few reports of walleye being caught from deep water using jigs and trolling minnow-type lures. Boaters are reminded that boats must be inspected prior to launch.